Should I Install Wire Partitions Instead of Chain Link Fencing? | S. W. Betz Company, Inc.
Should I Install Wire Partitions Instead of Chain Link Fencing? Most of the time, the answer to this question when asked by facility or warehouse owners is “yes”. If you need an indoor storage solution, wire partitions are already a better option than chain link fencing. There are several benefits of using wire caging over fencing in your facility, which are covered below to help you make the right choice. Wire partitions are modular; chain link fencing is not. This means when changes are needed, you can add to, subtract from, move and remove your wire caging as needed. Wire caging is made from panels, making it a versatile storage solution. Chain link fencing cannot be modified and moved as easily as wire partitions, making it inefficient. Chain link fencing is not a full enclosure. There is no ‘roof’ with chain link fencing, and so the top of the enclosure is exposed. Wire caging can be full enclosures with the top side included for added protection. 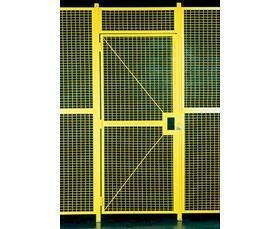 There are also many secure gate and door options for wire partitions that are not available for chain link fencing. Wire partitions are indoor systems. Chain link fencing was never made to be an indoor containment structure, whereas wire partitions are designed specifically for indoor applications. Efficiency is lost when a facility uses inappropriate structures for storage. Not to mention, both welded wire partitions and woven wire partitions are more secure than chain link fencing. They can’t easily be climbed, and including a top panel on your partition enclosure prevents top entry. And good luck trying to break into a secure wire partitions with bolt cutters, which can easily break through chain link fencing. Using chain link fencing on the exterior of your facility as a perimeter fence is one thing, but your indoor storage applications should be left to the security of a wire partition. The S.W. Betz Company, Inc. has been providing businesses in Maryland and beyond with all of their essential Weighing, Material Handling, Dock, and Warehouse equipment since 1933. We also assist customers with wire partitions and other warehouse equipment. We carry a variety of top warehouse equipment brands, such as: Morse, Wesco, Magliner, and Quantum Storage Systems, and of course, Cogan. If you would like to learn more about warehouse storage solutions, please contact S.W. Betz by calling 410-574-1414 or 800-332-0322 today! You can count on the S.W. Betz Company to work with you and provide you with our extensive knowledge of the industry. This entry was posted on Tuesday, April 5th, 2016 at 4:00 pm. Both comments and pings are currently closed.